Rex Orange County is an English recording artist and songwriter. At only 20 years old, Rex has made a name for himself making his own music and releasing it online through platforms like Soundcloud. His big break came when he was featured on Tyler The Creator’s album Flower Boy, singing on and co-writing the songs "Boredom" and "Foreword". The song “Sunflower” is a stand alone single released in 2017, with the music video coming in September of that year. This beautiful shot starts this music video. The song is about a girl that Rex compares to a sunflower, a symbol of natural beauty and frailty. She is such a beautiful ray of light, that she makes him realize there is no reason to be so down. She makes him want to live life again, and for that, he says he’ll love her forever. The intro of the song starts out with a distorted effect applied to the vocals, which helps display how downtrodden Rex is. However, once he meets his sunflower, the music kicks in with excited horns and a bustling drum rhythm. This groove is infectious, and Rex’s vocals are a perfect addition because of their smooth delivery. 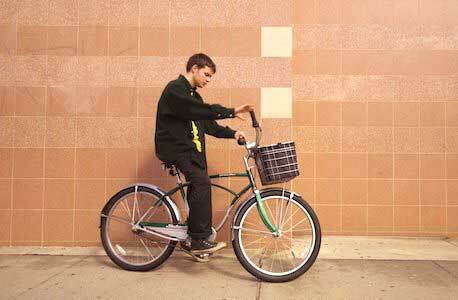 Rex wears two different pairs of chucks in this video, including this blue pair as he rides his bike.. The music video is divided into two parts. The first shows Rex going through his day depressed and miserable. This leads to him sitting alone at the pool, getting into a conflict with a group of guys, being chased around town, and running into a crackhead. 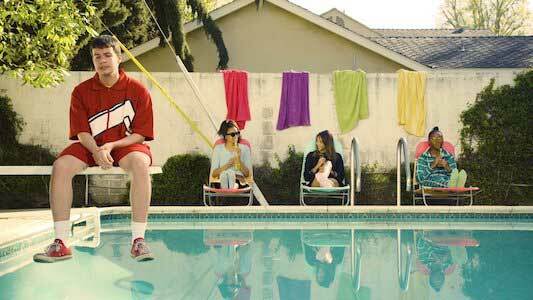 It’s during these scenes that we see him wearing two different pairs of chucks: a red pair while by the pool and a blue pair while running through the streets. He ends up hiding behind a car, and gets himself into a positive mindset. It’s in this half of the video where Rex’s fortunes change, as he goes back through the streets and realizes everything is fixed when he smiles. The guys that were chasing him give him his bike back, the crackhead gives him a thumbs up, and the girls that were at the pool dance with him. This whole journey fits with the fast paced music and the “life can’t get me down attitude” of the song, however the titular “sunflower” isn’t seen. Rex pulls himself out of his depression instead of getting help from his love, but despite this difference from the song, it’s still a fun video that fits the overall spirit of the track. 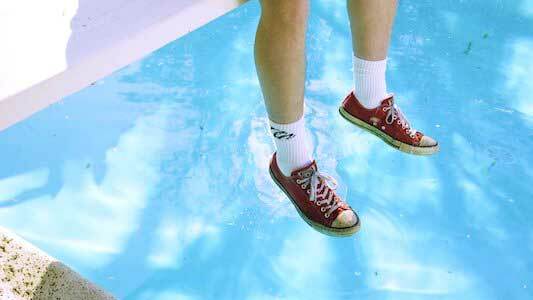 Chilling by the pool in red low cut chucks. Use the links below to get yourself into a positive mood with a new pair of chucks.